In the Huntington Library’s copy of the first book printed in English is a unique woodcut frontispiece. In what may perhaps be the only contemporary portrait of William Caxton, England’s first printer, a kneeling author hands two substantial volumes to a standing woman. The woman is Margaret of York, the king of England’s sister and recently married duchess of Burgundy, Caxton’s patroness; the volumes are the first English printed book, The Recuyell of the Historyes of Troye. Caxton maintained Margaret had been instrumental in encouraging his translation of this French romance. 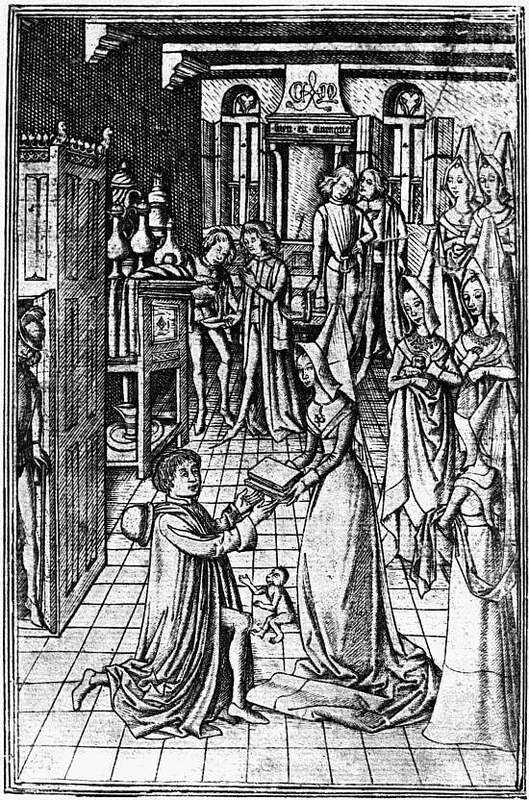 Easily overlooked, mediating between the merchant and the lady, mirroring Caxton’s pose, is the figure of a cheeky, smiling ape. At the wedding of Margaret to Charles the Bold, shortly before Caxton began his translation, pies were presented as the duke’s towns ready to be broken into by marmosets bearing axes, picks and shovels. In New York’s Metropolitan Museum of Art a lavishly enamelled 15th century Burgundian beaker depicts a sleeping merchant, his stockings being pulled off, his pockets picked and his packs rifled by a troop of apes. Though not noted by anyone before, this exactly echoes another entertainment at the wedding, where a sleeping merchant was robbed by apes and his merceries distributed among the audience. Caxton, merchant of London, governor of the English nation in Bruges, and diplomat at the court of Charles the Bold, would certainly have been present. What might he have made of such a show? What can this nexus of simian imagery with its examination of mimicry, theft, diligence and indolence, besynesse and ydlenes, tell us about early print, authorship, translation, power and patronage? This talk examines the fascinating, potentially complex role of the ape in medieval iconography and at the birth of English print. Late Summer Lectures is a series of lectures given by PhD students, bringing new research to a public audience. The final lecture takes place on Wednesday 2nd October at 19.30 in Alington House, Durham. For more details, view the full programme. Podcasts of previous lectures can be downloaded here.